Everything neat, great location, great owner, I highly recommend!! Perfect service, very friendly. The place was spotlessly clean, well appointed, everything was there that you could possibly want - even slippers and umbrellas :-) Other guests left magazines to help pass the time, and the air-conditioning was an absolute blessing :-) Two thumbs up. Would definitely stay here again. We were met at the property by Stella,the manager. The apartment is large and well equipped,microwave , washing machine,coffee maker etc. There is a tv and dvd player and the WiFi is very good. The apartment is on a busy street and is close to shops,restaurants and transport eg: taxis,buses and trams. Most major tourist attractions are within walking distance. The apartment was cleaned and sheets and towels changed midweek. Large wardrobe,plenty of hangers. Nice, adorable, warm and convenient place in Sofia. The host Stella is also hlepful for us. We feel grateful for her kindness. Location! Large apart. Pets friendly. Nice owners. Our host Stella was extremely friendly and helpful. She provided us with useful information about Sofia and picked us up from the airport in the evening after our flight was delayed. The location was perfect, within easy walking distance from the main sights and restaurants, and had good views of mountains from the window and balcony. If we return to Sofia, we would definitely stay here again! Check-in and out process was very easy. Our host kept in touch before our stay, on arrival and at check-out. She made us very welcome and explained some things to do in the city. Location was fantastic, very central to sites, bars and restaurants. The apartment was well equipped with all we needed, very secure and very clean. First of all the communication was very good. Everything was like as we talked with our dear Stella on the phone. She met us in a friendly way with big smile and positive energy and she guide us to place where we stay.She explain to us everything in detail. The apartment is at old building and it had a very retro style lift but inside the room is modern designed.The door is strongly safe.Living room bedroom kitchen all was very comfortable and high clean.Balcony is looks to busy road but is very quite.Locstion is perfect. Vitosha street clubs cafes and all atractive places are down at your legs.So if you want to stay in Sofia at a good price in a cozy place with perfect location you should definitely choose this place. Keep your good work Stella and thank you again. Lock in a great price for City Apartments – rated 9.1 by recent guests! City Apartments This rating is a reflection of how the property compares to the industry standard when it comes to price, facilities and services available. It's based on a self-evaluation by the property. Use this rating to help choose your stay! City Apartments offers accommodations in different locations around the center of Sofia. It is air-conditioned and fitted with a fully equipped kitchen and free WiFi. Parquet flooring, a modern bathroom, including a washing machine, a flat-screen satellite TV and a DVD player are further features of the City Apartment. Maid service is provided. The Vithosha Shopping Street is 1,950 feet away and numerous shops and restaurant can be found in the immediate surroundings. An airport pick-up service is provided by City Apartment. 뀐 Located in the real heart of Sofia, this property has an excellent location score of 9.7! When would you like to stay at City Apartments? Апартамент Сити ще ви накара да се чувствате уютно и удобно, предлагайки комфорт, панорамни гледки и спокойствие в центъра на София. Фирма Бг Апартаменти се занимава повече от 10 години с хотелски апартаменти в София. Ще ви помогнем да опознаете града и да намерите най-приятните места за вашия престой. Разположен на централен булевард в София, апартаментът е същевременно тих и приятен, в близост до забележителностите датиращи от Древен Рим до наши дни. На малките улички ще намерите приятни кафета и магазини на български производители. House Rules City Apartments takes special requests – add in the next step! City Apartments accepts these cards and reserves the right to temporarily hold an amount prior to arrival. Please contact City Apartment at least 1 day before your check-in date and provide the property with your estimated time of arrival. Please note that check-in after 19:00 is available upon request and at an additional charge. Please inform City Apartments of your expected arrival time in advance. You can use the Special Requests box when booking, or contact the property directly using the contact details in your confirmation. 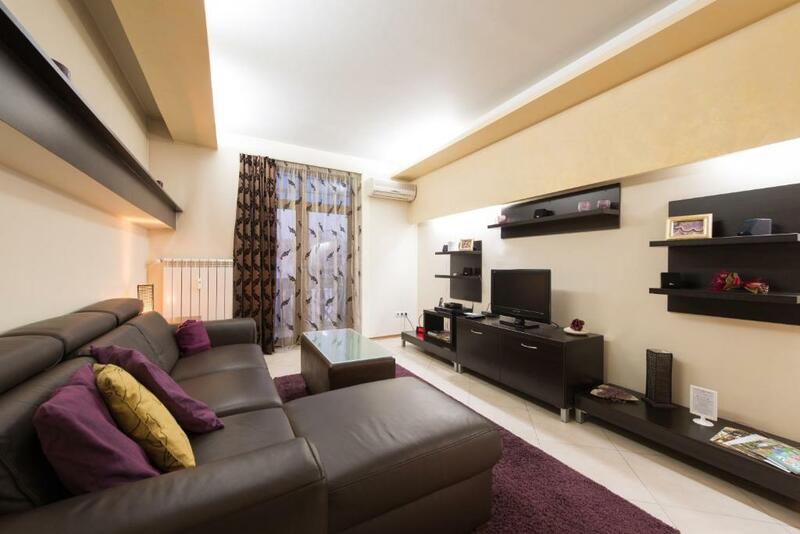 • Two-Bedroom Apartment - 9 Bistritsa Str. The apartment was on the 5th floor(which we knew)but does have a lift which unfortunately is extremely small,and I stress small! There are a 100 steps to the 5th floor so if the lift doesn’t work,which it didn’t on two occasions,you would have to climb these. The stairwell is extremely dingy and grubby and the lights did not work when we arrived but this problem was rectified. The apartment itself was well furnished but could do with a lick of paint and some decent curtains in the lounge area. The quilt is too small for the size of the bed which led to some tugging on both sides! A small point I know but a valid one on cold nights. Repair is necessary! The bathtub is leaking before 5 years! The beds is uncomfortable at all. No air conditioner in bedroom. Also haven't heater! The TV in the kitchen is (!) 14" (antique). Price does not match the quality. Sad. maybe the dishwares and cutlery could be implemented..
the owner was absolutely fantastic, she offered a transfer from the airport for a cheap price, explained us everything and was very very nice. The apartment is in a central place, 2 bedrooms, 2 bathrooms (1 small), furnished with everything (including air conditioning) and at a surprising price..what can I say? Difficult to find any better...thanks Stella!!!! Very nice people and place. .Wery big clean and well equipped appartment Quiet and very close to vitosha street. Stella wait for us and was very helpful and kind.